By Deborah Love, Executive Director, Eagle Forum of Alabama and Shanna Chamblee, Deputy Director of Legislative Affairs, Alabama Gun Rights Inc. The events at Marjory Stoneman Douglas High School have left students, parents and an entire nation in agony. Since the Columbine massacre, our nation has been horribly awakened to a new normal – a world in which these massacres are not all that irregular. Each time one occurs, people are motivated to offer idyllic solutions so that such an incident may not happen again. Eagle Forum of Alabama opposes the recently introduced resolution HJR23 which pushes a Constitutional Convention as a way to obtain term limits for members of Congress. Term Limits via an Article V Constitutional Convention is a bad idea on multiple counts. We don’t need yet another call for an Article V Constitutional Convention, which according to former Supreme Court Chief Justice Warren Burger and other Constitutional scholars, cannot be limited to any one issue and could become a Pandora’s Box. There are many problems with HJR23. 1. We already have ‘term limits’, they are called “elections”, every two, four, and six years. Just because voters are derelict in their duty, does not mean we must change our process. 2. ‘Artificial’ term limits means giving the bureaucracy a LOT more power, in that institutional memory and experience is no longer available. 3. Voters are prohibited from voting for the person they believe is best for that office. 4. In the last term any official serves, without re-election on the horizon, there is no longer the accountability that was once there. 5. Term limits can prevent legislators from gaining the experience they need to become skilled lawmakers. 7. Here’s a look at congressional tenure by the numbers: 9.1 Years of average length of service in the United States House of Representatives as of January 2013, according to the Congressional Research Service. Average length of service in the U.S. Senate as of January 2013 is 10.2 years. You can register now by mailing in your tax deductible payment today. Your check of $150 per ticket or $1,250 for each table should be mailed to the Eagle Forum of Alabama Education Foundation. Each table seats ten. Be sure to include the names of those attending with registration payment for the banquet . All checks must be mailed to 4200 Stone River Circle, Birmingham, AL 35213 and marked “banquet attending” if you are registering for the banquet. If you would like to make a general donation to the foundation by supporting the banquet mark “banquet donation” on the check. The reception begins at 5:30 PM. Seating for the banquet will begin at 6:00 PM. The banquet begins at 6:30 PM. 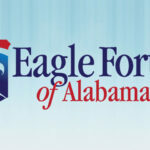 Sponsor the Eagle Forum of Alabama Education Foundation Banquet! Promote your business or organization by making a tax deductible contribution to the important work of the Education Foundation. Sponsors will enjoy a special gathering with Phil Robertson and photograph with him. Each sponsorship includes a table of ten and two tickets to special gathering with Phil. For more details on the sponsorship benefits and opportunities contact our office today at (205) 879-7096. Two tickets to a special gathering with Phil Robertson before banquet. Photograph with Phil Robertson and a reserved table for the banquet. Three tickets to the special gathering with Phil Robertson before banquet. Photograph with Phil Robertson and a reserved table for the banquet plus more. Four tickets to a special gathering with Phil Robertson before banquet. Photograph with Phil Robertson and a reserved table for the banquet plus more. Eagle Forum of Alabama has fully examined each version of the Alabama State Consolidated ESSA Plan. See our first full analysis here, presented to then Superintendent Sentance. The latest draft of the Alabama State Consolidated ESSA Plan does have some improvements since the first drafts, such as the removal of the Alabama Ascending Plan, however, major problems remain. Most importantly, social and emotional learning (SEL) programs, privacy concerns, and Common Core remain in the current plan that the board will vote on this Thursday. See Eagle Forum of Alabama’s latest analysis on the new draft and the remaining problems which must be addressed. Eagle Forum of Alabama encourages the Interim Superintendent Ed Richardson, Governor Ivey, and the State Board of Education to take the best advantage of ESSA that is possible under the law. Unless the items or areas allowing for flexibility under ESSA are utilized, no greater flexibility will be achieved for Alabama in education. We recommend that the State Board of Education vote down The Plan in its current form until these recommended changes have been made, since The Plan will be a legally binding document with the federal government. There is no guarantee the USDOE will approve amendments or changes at a later time for Alabama. Ultimately ESSA is a policy paradox for Alabama as there is some opportunity for flexibility and movement away from the failed federal initiatives. However, there remains extensive and coercive federal overreach under ESSA. Eagle Forum of Alabama supports the ALSDE in movements toward greater flexibility and independence from the federal government. This approach will yield greater positive results for student achievement, involved parents, and inspired educators. Please encourage your Alabama State Board of Education member to vote down the plan unless these important changes our made. Contact your Alabama State Board of Education member today. Tell them to oppose the plan as submitted because SEL, Common Core and invasive data collection harm Alabama’s students. We want true academically superior standards and programs. Contact your board members now! Remove social and emotional learning requirements, along with other complicated psychological evaluation that exceeds the training of public school educators and administrators. This is not the role of public school educators, and these issues fall outside of the ALSDE purview. They may violate parents’ rights, and will likely result in unknown costs to the education system including legal fees. [Emphasis mine.] Blad, Evie “No State Will Measure Social-Emotional Learning Under ESSA. Will That Slow Its Movement?” Education Week. (October 4, 2017) 4 pages.RECOMMENDATION: Pages 34-35, remove wording:“Strategies and Activities: Create Restorative Justice practices for school discipline – Restorative Justice is a powerful approach to unacceptable or at-risk behaviors that focuses on retooling consequences so that they are less negative and punitive. Rather, the consequences involve constructively “repairing” the “damage” done by the student in a way that shifts the focus from punishment to learning” … “Train LEAs on Positive Behavior Supports philosophy (PBIS) o Work with LEAs that have high numbers of out-of-school suspensions and expulsions of special education students. o Analyze the data determining the incidents, develop a plan, implement the PBIS philosophy to fidelity and review the data, adjust strategies as needed. o Review the end-of-year data. Bullying PLU/CEU – Collaborative effort of the ALSDE and Alabama Education Association (AEA): Closing Achievement Gaps through Community Conversations that Lead to Collective Action – The Community Conversation focuses on helping a broad cross-section of the community engage in a discussion about how all students can be free of bullying. It is about meeting the educational and social emotional needs of children-as well as their health needs-and engaging families and communities in addressing those needs as prerequisites to learning in school. The ALSDE has recently organized and is finalizing the staffing plan of its Office of School Improvement and Turnaround (OSIT). A primary function of this office will be to create and review existing policies and practices for school improvement and intervention, in addition to developing supports for the LEAs requiring assistance. These supports will include evidence-based improvement strategies and models; addressing human capital capacity through professional learning and development; school and district audits with action planning to address priority needs; matching schools and districts with vetted external partners to address specific needs; and technical assistance by a cadre of OSIT staff that includes academic content experts, school improvement and strategy personnel, in addition to climate, culture, and mental health specialists. Promoting community and parent involvement in schools. Providing school-based mental health services and counseling. Establishing or improving dropout prevention. Identifying and utilizing strategies to address chronic absenteeism. Supporting re-entry programs and transition services for justice-involved youth. Implementing programs that support a healthy, active lifestyle (nutritional and physical education). Implementing systems and practices to prevent bullying and harassment. Developing relationship building skills to help improve safety through the recognition and prevention of coercion, violence, or abuse. conflict resolution programs. 3. Remove mandatory requirements to use “College and Career Readiness” standards (also known as ‘Common Core’ Standards), and allow ALSDE the flexibility to use other standards as well as CCR. The 2015 NAEP results place Alabama dead last in Math and English in the Nation. This is a significant decline from where Alabama was trending before Common Core/College and Career Readiness Standards were implemented in 2012 – 2013. Prior to implementation of these standards, Alabama had been trending upward. The terms ‘college and career’, ‘college and career readiness,’ and ‘world-class expectations’ have pre-defined meanings connected to common core standards. These terms would otherwise have highly favorable implications for Alabama education if they actually resulted in a “world-class education” or an education that truly equipped ALL Alabama students for the future. However, these terms have been nationally hijacked by Common Core advocates to embrace common core standards which fail to equip some students with the ability to pursue a college education following high school graduation. Further, these standards have been proven to be conspicuously detrimental Alabama students’ academic education. Effectively, a “career or career readiness” path may limit students’ job opportunities to the labor pool or lower paying jobs. Rather than equipping students with a world-class education or inspiring students to dream of future college possibilities and equipping them to pursue such possibilities, a career readiness path can mean limiting Alabama students’ creativity, potential and education. More importantly,using these terms in the Alabama Consolidated State Plan, straps the ALSDE and Alabama students, educators and administrators to predefined national standards and assessments resulting in federal expectations and oversight. This is a violation of the ESSA Act. See Introduction. Alabama’s English proficiency assessment went through a standards setting study in 2016 in order to meet the rigorous Alabama language demands. of College and Career Readiness standards. Alabama will use the 2016-2017 school year test results for baseline data. Alabama’s English proficiency assessment went through a standards setting study in 2016 in order to meet the rigorous language acquisition demands of College and Career Readiness standards. Therefore, Alabama will re-calculate the target percentages with the 2016-2017 baseline data once we have two years of data. Alabama’s EL committee compared our English language proficiency assessment to other states that use the same assessment to set targets for growth. Alabama understands the impact school has on career and or college success. As a result, we have included our college and career ready indicator as another measureable indicator for high schools in this area. Students have multiple opportunities to be declared college and/or career ready. Students can be identified as college or career ready by the successful completion of one of six options. Our goal is that our students will benefit from challenging, world-class standards in all subjects. One of the supporting structures for this goal is that all students will earn at least one college or career readiness indicator prior to leaving school. As a measure of success, our goal is to increase the college and career readiness rate of all students in a cohort to 94% by 2030. The six indicators of college and career readiness currently utilized are achieving a benchmark score on the ACT, scoring a 3, 4, or 5 on an Advanced Placement exam/scoring a 4, 5, 6, or 7 on an International Baccalaureate exam, scoring silver level or above on ACT Work Keys, earning a transcripted college credit while still in high school, earning an Industry Credential, or being accepted for enlistement into any branch of the military. These indicators are periodically revisted to determine if additional indicators need to be included. A screen shot of the current Alabama College and Career Readiness Dashboard can be found in Appendix C.
Re-letter Appendixes D to C, and E to D.
RECOMMENDATION: Page 69, remove Appendix C, and Re-letter Appendixes D to C, and E to D.
Eliminate supplemental information that is superfluous and can result in creating unintentional requirements and unintentional relinquishment of state control to the federal government. We do not want to limit the way in which Alabama is allowed to use the federal dollars, nor do we want to obligate ALSDE to utilize our allotment in any particular way, now or in the future. We do not want students to increase the use of electronic devises unless absolutely necessary. “Study by faculty members at West Point finds students perform better academically when laptops and tablets are banned from the classroom.” Straumsheim, Carl. “Leave It In the Bag.” Inside Higher Ed (May 13, 2016) 10 Pages. As a part of ensuring that English learners succeed and meet the long-term goals, the ALSDE has collaborated with the Southeast Comprehensive Center (SECC). The SECC will support ALSDE with co-developing will develop an EL Plan that will guide local education agencies and schools with supports designed to enhance and improve instructional programs for EL students. This project will include co-planning and co-facilitation of EL stakeholder meetings for developing the plan. SECC will provide ALSDE with expertise, resources, strategies, and tools for working with ELs. In addition to developing an EL plan and resources, the SECC support will enable the ALSDE to will measure the impact professional learning has on EL students and the change in practice at the local level.RECOMMENDATION: Page 20, paragraph iv.,a., remove wording:Alabama embraces utilizing multiple measures for student success and is working to create a system of public education that is equitable, accountable and just. Through meetings with various stakeholders, the Alabama ESSA Accountability Workgroup, and other state-wide meetings, it was apparent that stakeholders shared an interest in having indicators supportive of Alabama’s personal allegiance to the continuous self-improvement and commitment to helping children find their success. not only in school but in their careers and lives thereafter.RECOMMENDATION: Pages 27-29, remove all yellow highlighting. The yellow highlights set up a new, unnecessary, costly state agency called the Office of School Improvement and Turnaround (OSIT.) Existing ALSDE currently performs these responsibilities.RECOMMENDATION: Page 36-37, remove entire REACH section. This is another new, unnecessary, costly state program that will put a strain on existing ALSDE staff and limited resources. Remove “birth” from age requirement in Early Childhood Education. The Plan currently requires Alabama to provide early childhood education from birth through third grade. Alabamians strongly disagree about the value of early childhood education. Certainly infants and toddlers are not pursuing an academic education as charged by the ALSDE. Not to mention, that there are exorbitant costs associated with these programs. The Department currently doesn’t require any formal education until age 7. Further, there is proof that there is little value if any in early childhood education, and that any gain is quickly lost by th third grade. Since Alabama is not required to commit to an early childhood education it is certainly unnecessary to commit to begin education for families at birth. This is can be extremely invasive and violative of parental rights. Therefore, to do so will place unnecessary requirements on Alabama’s students, educators and administrators, not to mention a cost burden we are not capable of bearing. Alabama should not commit to this age requirement in our State Plan. Additionally, Alabama is committed to providing a strong educational foundation built by a high quality early childhood education (birth through third grade). The Every Student Succeeds Act provides an opportunity to address the importance of high quality early learning experiences, and to support the development of a seamless learning continuum providing the fundamental skills needed to succeed in later years. Alabama will work with LEAs to enhance early learning and improve coordination and alignment of early learning programs from birth through third grade across Titles I, II, III, IV, V, and VII. Please refer to Appendix D C for all allowable uses of Title funds. Alabama students need to understand the requirements of the United States Constitution and how a “Republic” works. The ACSP summarizes the ‘world-class expectations’ for students. It is commendable that the ACSP encourages students to understand the requirements of our government, an essential component of a well-educated society; however, the ACSP inaccurately identifies the United States government as a democracy. The United States is not a democracy; it is a REPUBLIC! Two very different forms of government. This wording is a poor reflection on Alabama’s academic improvement. 7. Remove the repeated references to “every student” and “all students,” and replace with “every public school student,” and “all public school students.” We have private school students and homeschooled students, who do not come under this act. This language is potentially harmful to unintended recipients. RECOMMENDATION: Do a document search and replace appropriately. 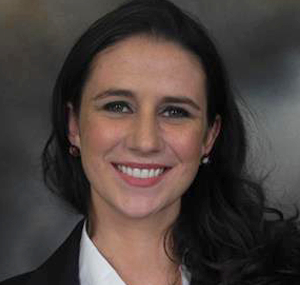 Sharman Ramsey is a Dothan native and President of the newly formed Panama City, Florida Eagle Forum Chapter. 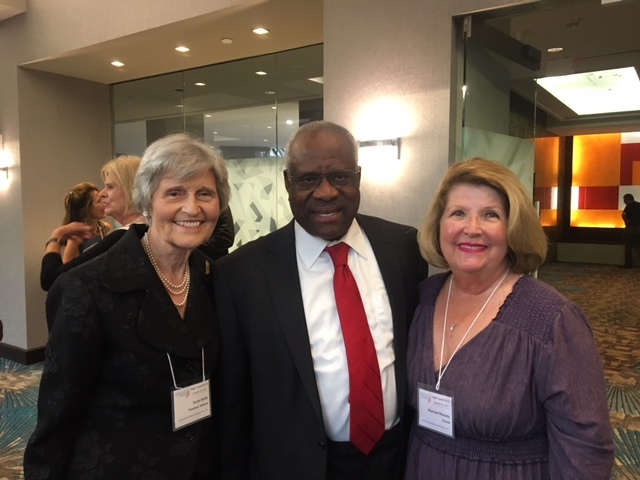 See her below with Eunie Smith (Eagle Forum National President and President of Eagle Forum of Alabama) and U.S. Supreme Court Justice Clarence Thomas. Since he was hired, Eagle Forum of Alabama maintained continuous contact with Superintendent Michael Sentance and offered our support on issues of importance to academics in Alabama schools. We wish him well in his future endeavors. We were disappointed that the Superintendent did not replace common core with sound, proven academic standards. A September 2017 McLaughlin poll indicates 68% of Alabama respondents view common core as federal overreach. Superintendent Sentance also had other opportunities to support local control and to move Alabama’s public education system away from federal interference that he did not fully utilize. The board has received a 29 day extension for submitting Alabama’s ESSA plan to the Department of Education and should use that time to make needed changes. While Eagle Forum is not privy to personnel related matters, we are confident that our elected Board of Education intended to act in the best interest of Alabama students and parents. Interim Superintendent Ed Richardson has our very best wishes. We are committed to working with the Superintendent and members of the State Board of Education to move Alabama forward with superior educational standards and opportunities for students. The Alabama State Board of Education is an important institution in our state government that allows the public to engage with important decisions and changes made within the ALSDE. Without an elected State Board of Education, many problems and concerns within ALSDE would never be addressed or made public. Alabama’s students and families should always be the primary stakeholder. Without an elected board, their voice in this particular decision would not have been considered. With the passage of the Every Student Succeeds Act (the replacement for No a Child Left Behind), each state is submitting its ESSA implementation plan (The Plan) to the federal Department of Education. The reference to Alabama College and Career Standards, which is Common Core. Core, the state could still well be bound to keep standards based upon Common Core. Programs promoting Social Emotional Learning and other invasive programs. teaching students what government officials think are “proper” thoughts, attitudes and beliefs. This is the purview of parents, not the government. Eagle Forum has been assured that SEL would not be used in Alabama schools. But, it was addressed in a number of sessions at this summer’s MEGA conference for teachers, and Superintendent Sentance recently sent out a letter inviting all interested parties to a training session on SEL. Please contact your State Board of Education Member to ask that they vote against this ESSA contract with the federal government unless The Plan is significantly revised and the invasive programs have been removed. Eagle Forum of Alabama has conducted an extensive review on ESSA and the Consolidated State ESSA Plan (“The Plan”) for Alabama. Eagle Forum of Alabama has reviewed committee reports from the strategic planning committees formed by Superintendent Sentance and the Alabama Ascending Plan and has studied the ESSA Implementation documents and report in addition to the Consolidated State ESSA Plan because all are attached or were referenced as sources for the consolidated draft plan from Superintendent Sentance. Eagle Forum of Alabama diligently monitored, researched and served on implementation committees, sub-committees and attended the parental engagement tours held throughout Alabama. Eagle Forum of Alabama recorded, photographed, and collected official handouts as well as documents from every implementation committee event or meeting held in the state. As stated by Superintendent Sentance at the State Board of Education meeting on July 11, 2017 when referring to the Consolidated State ESSA Plan for Alabama, “this is a legally binding document for the state of Alabama.” Eagle Forum of Alabama therefore recommends that Alabama utilize the greatest amount of flexibility authorized under the ESSA and revise The Plan as stated below. The Plan incorrectly states that all stakeholders were involved in The Plan’s development. Eagle Forum of Alabama found that parents were not properly valued or included in the process, and that it was extremely difficult for Alabama’s citizens, parents, and students to engage in the ESSA implementation process. In contrast, this process made it easy for state employees, paid lobbyists, agency heads, and state paid administrators to participate. There was also concern about possible violations of the Alabama Sunshine Law in relation to the date and time of announcements for ESSA committee meetings. Page 8 of The Plan claims that “ESSA Implementation committees worked in conjunction with Strategic Planning Committees.” This is also incorrect. There was no meeting or correspondence between these committees or bodies unless it was conducted unofficially without the consent of the general ESSA implementation committee. The development of The Plan described on page 7 is inaccurate as well, as parents were not involved in the implementation committee or its sub-committees in a meaningful way. Neither were parents involved with the strategic planning committees in a meaningful way. The Plan therefore needs to reflect an accurate record of their lack of involvement or access. Page 14 describes an “expansive process,” in which “Alabama has been diligently engaging stakeholders”. Detailed communications were made by a committee member to the Chair Jeana Ross about the serious problems with the online survey by ESSA committee members. The questionnaire was difficult for parents to find, difficult to access from the website, and the instructions and submitting process was not working properly. While the committee member was told these problems would be addressed, this same problem for parental or public input remained during the implementation process. The Plan should take advantage of the flexibility authorized under ESSA and adjust certain provisions accordingly. Both the ESSA and the General Education Provisions Act (GEPA) explicitly restrict the role of the federal government in education. While GEPA puts the SEA’s in an oversight role for federal grants and asks them to encourage participation in their programs, for example, Section 438 states that none of its provisions authorize the federal government to exercise any “direction, supervision, or control over the curriculum, program of instruction, administration, or personnel of any educational institution, school, or school system.” Thus, the law clarifies that states should not allow undue influence by the federal government on its curriculum or published documents. Florida’s ESSA plan requests waiver from the 95 percent testing mandate cited under ESSA section 1111(c)(4)(E) which is referenced on page 28 of the consolidated plan. Eagle Forum of Alabama recommends Alabama pursue the same waiver request from this mandate, as the federal government has no legal authority for this mandate. In addition, ESSA provides some prohibitions on testing mandates from the USDOE and the Secretary of USDOE. Moving control of testing and assessments back to the states is a step towards real education reform and local control. Lastly, the Superintendent and Alabama State Board of Education members have been successful in obtaining more flexibility from the current Secretary of Education by ending the Act Aspire contract. As State Board of Education member Jackie Ziegler pointed out during discussion of The Plan at SBOE meeting; Page 14 contains an error that needs to be changed. ACT Aspire will not be Alabama’s interim accountability system. Eagle Forum of Alabama’s research shows that Global Scantron is a Common Core aligned system as well. The term “Students” needs to be clearly described as public school students. Page 9 uses the term “all students,” which is then used throughout the ESSA plan. Given that this document is purportedly “legally binding on the states” as stated by Superintendent Sentance, The Plan needs to avoid overly broad language and, therefore, clarify that the word “student” is in reference to public school students only. The United States government has a Representative Republic form of government, not a “democracy”. “Democracy,” however, is what describes our government on page 9 of The Plan. It is of pivotal importance that students understand basic civics starting with a proper understanding of the American system of government as outlined in the United States Constitution. In order for students to understand and exercise their rights as citizens, they must have an accurate and basic knowledge of our government structure, and this error needs to be addressed. Eagle Forum of Alabama agrees with the implementation committee recommendation that Alabama’s revision process for its academic standards should provide greater feedback to parents and the public who have concerns about the standards review process. The course of study statute addresses the process for changing course of studies. Section 16-35-1 states, “Composition; appointment, qualifications and terms of members. 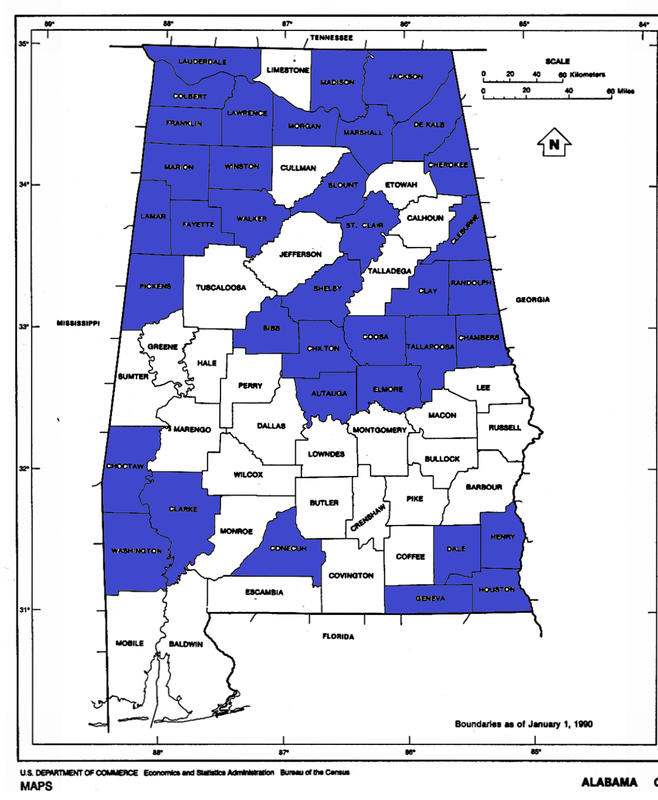 The State Board of Education shall appoint a courses of study committee as set forth below for the purposes and functions as hereinafter provided.” Since new data has emerged following the implementation of Common Core in Alabama, the Plan faces possible compliance issues as Common Core does not provide challenging academic standards. Eagle Forum of Alabama encourages moving Alabama forward with standards that hold a proven academic track record of growth and success. There is no acknowledgement of the correlation between Common Core implementation and failing test scores. Before Common Core implementation Alabama’s academic achievements in reading due to the Alabama Reading Initiative were acclaimed nationwide. (https://www.alsde.edu/sec/ari/History/ARI%20History.pdf) At this time, Alabama had risen from near last to 25th in overall grades and scores according to Education Week. But that was before Common Core implementation in 2012 in Math and 2013 in English. According to 2015 NAEP tests, Alabama’s average math score in both 4th and 8th grade was the lowest of any state. Some Common Core promoters continue to blame Alabama’s poverty rate as the cause of its failing scores, but in doing so, they ignore Alabama’s previous successes under its earlier standards despite these demographics. Indeed, according to PARCA Perspective published in October of 2015, “Between 2013 and 2015, Alabama’s average score declined in both grades. …While Alabama’s higher poverty rate puts it at something of a competitive disadvantage in national comparisons, a deeper look shows it’s not Alabama demographics skewing the results. Name the group-black, white, Hispanic, poverty and non-poverty-all perform worse than their peers in all other states.” The Plan needs to adequately reflect Alabama’s NAEP history. Eagle Forum of Alabama encourages Alabama to seek greater flexibility and independence from the federally controlled Common Core system, which promotes academically inferior standards. Common Core was not created by educators or leaders in Alabama. Therefore, it should not be represented as Alabama led or created. Alabama’s education system must move towards local and state control. Most importantly, Eagle Forum of Alabama wants academically superior standards to replace the failing Common Core standards. On page 16 of the Plan it falsely describes Common Core as “rigorous”. “Access for ELLs [English Language Learners] recently went through a standards setting study in 2016 in order to meet the rigorous language demands of College and Career Readiness Standards.” (pg. 16) As the Superintendent Sentance has stated Common Core standards are not “internationally benchmarked” nor “rigorous” standards. We recommend promoting greater flexibility for local educators and more independence from the USDOE in The Plan. The Plan should therefore remove its “College and Career ready” indicator for accountability, as tying Alabama to this indicator with 10 percent ensures the continued promotion of Common Core which has failed Alabama’s students. (pg. 21-24) The Alabama Ascending Plan also reinforces Common Core on page 6 and the Strategic Planning Committees promote Common Core throughout. Common Core is referenced in the documents as “College and Career Readiness Standards.” (pg. 16 of The Plan) In order to achieve the long term goal outlined in the Plan to “reduce the number of students not proficient in 2030 by 50%” Common Core must be replaced with superior standards. The data collection sub-groups official recommendations that were unanimously supported were that no data would be collected beyond what was required by the federal government pursuant to ESSA. That means anything collected indirectly or directly for the Federal Government beyond what ESSA requires is in violation of the data sub-groups official recommendations. Eagle Forum of Alabama supports the data-sub groups unanimous recommendations to protect children from invasive data collection practices that violate student and family privacy. The Superintendent Association, along with the data work group, recommended only providing what was legally required and nothing further. The number used for the N score is much lower than the number the state should utilize to exercise flexibility. This not only conflicts with suggestions from Alabama’s educational leaders, but it endangers student privacy and Alabama’s sovereignty. De-identified data or aggregated data can be re-identified to contain personally identifiable data. https://techscience.org/a/2015092903/ The Plan proposes a number of 20 as referenced page 13, but ESSA does not require 20 for the N score. Therefore, Eagle Forum of Alabama recommends the number of thirty or higher for the N score. Data from areas of “student engagement,” “educator engagement,” “school climate and safety,” or any data that could lead to increased psychological profiling in the accountability scheme should not be used or listed in The Plan. Eagle Forum of Alabama recommends ALSDE use academic factors instead. The state sets out as its goal to identify students starting in 3rd grade as at risk of dropping out by using a strategy of the Graduation Tracking System (pg. 33-34). Clarification of this system is needed, as is clarification of its purposes, including its purpose: to “increase grade promotion rates leading to students graduating on time.” This language is unduly vague and without clarification, leaves room for ineffective instruction and undue grade promotion. Significantly tracking systems usually hold high dangers for student privacy and Alabama currently has no comprehensive student privacy protections. Labeling students at an early age can be very detrimental in tracking systems. Lastly, this tracking system contains an inherent flaw by allowing the criteria to be constantly shifted. (pg. 34) Eagle Forum of Alabama advises not including any tracking systems in The Plan. School-based counseling and mental health programs should not be expanded at this time, as there is no way to protect this data. FERPA has been critically weakened by USDOE and is outdated as it was passed in 1974. The law is antiquated in addressing the technological changes in society. In Alabama, the Comprehensive Student Privacy Protection Act has not yet been passed. There is no privacy protection for Alabama’s students; therefore, students will be harmed by PBIS. It should not be included in The Plan. The diagnostic testing requirements listed in the Alabama Ascending Plan for entering kindergarten have not been fully defined, and not enough information has been provided. Any such pre-assessments should only serve to improve the teachers’ approach and shouldn’t be tied to any state or local assessment. In regards to The Plan we recommend that any reference to an assessment aligned to the diagnostic testing be dropped. The four-year plan in 8th grade described in Alabama Ascending is a continuation of an earlier model from Plan 2020. Mandatory plans of this nature are not voluntary and should be under the control of the parent and, student not included in federal agreements. In addition, states that have moved forward with mandatory four-year plans or mandatory career plans violate parental and students rights. http://www.cnn.com/2017/07/08/us/chicago-high-school-graduation-requirement/index.html Mandatory plans of this nature may face constitutional litigation from families or students as public schools are not constitutional free zones. It is best for the students and families to make these decisions. The school does not need to approve of plans or require one from the student. In addition, the terms “suicide prevention,” “bullying and harassment,” “crisis prevention and conflict resolution,” “human trafficking,” “child abuse awareness and prevention,” “safety and violence prevention,” and “trauma informed classroom management” used in The Plan are outside of the realm of academic teaching and should be removed. Alabama law already requires educators and administrators in public education to report suspected child abuse and training already is provided in many of these areas. While these are important issues, it is not the role of the public educator to address them. Some of these areas of involvement infringe on the role of the parents in society and involve subjective value judgement of students and could lead to possible discrimination as these terms or programs are defined. The primary role of the educator should be providing quality educational instruction to their public-school students, not addressing social or societal problems. Office of School Improvement and Turnaround (OSIT): Eagle Forum of Alabama finds that the creation of a new state agency (OSIT) is promoting the wrong approach to helping schools needing improvement and is a counterproductive use of federal or state funds. On page 24 it describes using staff to intervene by using “Climate, culture, and mental health specialists.” These staff members will be promoting social and emotional health, which co-opts parental rights and will not improve student academic performance. Schools will be provided different levels of “support” from the office depending on how they perform on Alabama’s six selected indicators, including the college and career ready rate for that school. This is an overly broad practice of intervention in schools and promotes the top down approach that has not been effective in the past. OSIT has no record of success and should not be institutionalized by the ESSA plan. PBIS Social and Emotional Concerns: The promise to improve “school conditions” for Title 1 schools is listed on page 32-33 of The Plan this includes social and emotional learning agendas. For example, it includes references to “restorative justice practices for school discipline” and training LEAs for positive behavior supports (PBIS) philosophy. This portion of the Plan is somewhat unclear and unduly broad. Given a number of schools receiving Title 1 funds also serve high-achieving populations as well as high-risk populations, it seems The Plan is establishing a state-wide discipline approach that will not fit needs of every school system. Alabama should therefore leave room for local agencies to be trained in the philosophy that best works for its students’ successes. While Eagle Forum of Alabama believes strongly in helping children with special needs, PBIS is being used to improperly label children with disabilities or the wrong disabilities. Parental consent should be required for mental health screenings and to avoid any constitutional violations. The data file produced from PBIS is also suspect for its authenticity, educational effectiveness, and collection method. PBIS should not be included in The Plan. 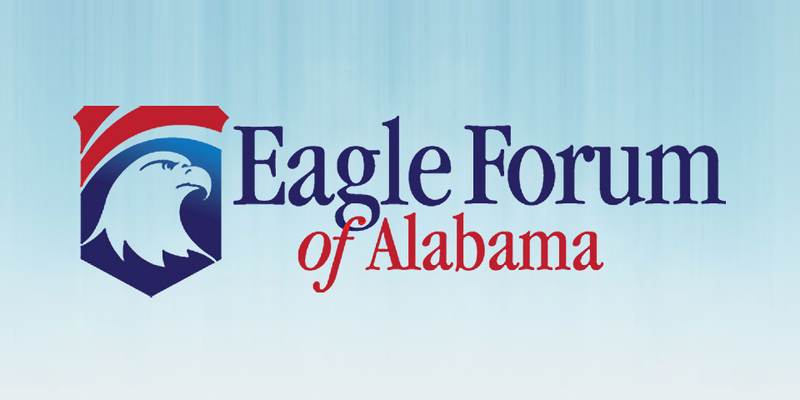 Student Support and Academic Enrichment Grants: Because these programs violate constitutionally protected parental rights and promote invasive psychological practices, Eagle Forum of Alabama objects and recommends their removal. Section 4108 of ESSA describes programs that utilize a broad range of factors that will likely result in subjective or invasive programs: “Early identification of mental health symptoms, drug use, and violence, and appropriate referrals.” Medical treatment and referrals should require parental consent, but there is no legal requirement for consent in this section. Teachers are not trained as medical or psychological professionals to diagnose children or to conduct screenings. This will lead to a host of problems for Alabama’s students in regards to academic development. 21st Century Community Learning Centers: Eagle Forum of Alabama’s research and study finds that 21st Century Community Learning Centers have not been an effective use of educational resources. Public education is a part of the community but it is not the community alone. These community learning centers will be primarily used for non-academic purposes and will not be dedicated to Alabama k-12 system. We recommend not including any agreement involving community learning centers. Eagle Forum of Alabama, like other leaders in education policy, wants parents and students engaged in their education at every step. However, the “Engaged Families and Communities” programs listed in ESSA and cited on page 21 of the Plan do not promote family engagement. Instead this aspect of ESSA promotes monitoring and collecting personal data on families-especially their interpersonal communications and their communications with the public education system. Data collection on families does not improve parental engagement in the public education system. It should be removed or altered appropriately. Eagle Forum of Alabama recommends removal of all aspects of the Reach initiative and Reach Advisory Program from The Plan. The student advisory program listed on page 34-35 of the consolidated plan raise problems for parental and student rights. “It is not everyone’s responsibility”; it is students and parents responsibility to direct and control their education. This is a philosophical perspective of education that violates parental rights and promotes collectivism in Alabama’s public education system. More information would need to be provided to parents before this program should be supported. “What if the LEA determines that it is not in the child’s or youth’s best interest to attend the school of origin or school requested by the parent, guardian, or unaccompanied youth?” The section of instructions in this non-regulatory guidance are concerning in relation to parental rights and other legal rights of families and students. While aspects of homelessness student data collection is required by ESSA, Eagle Forum of Alabama suggests removing the identification factors from the plan listed on page 54. We did not find that these exact factors were required. Additionally, the non-regulatory federal guidance from (722(g)(1)(B) engages broad sweeping assumptions about homeless children and their families. Eagle Forum of Alabama encourages a re-examination of the enforcement of this ESSA section to ensure the best treatment of homeless children and their families especially in regards to their legal rights pages 54-59. The Plan on page 8 and as well as the Alabama Ascending Plan include the strategic planning committee reports and the Alabama Ascending Plan which were composed in major sections by these planning committee’s recommendations. Eagle Forum of Alabama finds that the science, math, and reading committees reports will, if implemented, increase bureaucracy by creating new agencies and increase federal control of Alabama education’s system. Most importantly, they fail to address deep problems with Alabama’s current Common Core standards. Eagle Forum of Alabama sees that it is not teacher preparation or experience that is the greatest barrier for students but instead the failing system of Common Core especially its impact on testing, professional development, and curriculum. Common Core’s emphasis on informational texts replacing classic literature is not addressed by reading committee. Alabama’s teachers and students can compete with any state but face bureaucratic barriers to focusing on academic achievement. The reading committee supports keeping the “College and Career Readiness Standards” but fails to address Common Core’s impact on teachers and students shown by NAEP scores. (pg. 5 of reading) “The council will develop a statewide literacy plan in collaboration with MS, SC, and TN with support from the Regional Education Lab (REL).” (page 14 of reading) Eagle Forum of Alabama finds this announcement deeply concerning as Alabama needs to control its own teacher preparation not outside organizations or regional councils. The science committee report primarily focuses on tools, funding, and a three-dimensional approach to science education. While Eagle Forum of Alabama also supports a hands-on approach to science education in part, teacher’s knowledge in their subject area remains critical. Instead of swinging the pendulum solely towards a three-dimensional approach reducing emphasis on knowledge for students and educators a more balanced approach would be more productive for science education in Alabama. If tools and funding are issues at this time CPLE would not be a productive use of state educational resources. There are already many SEA agencies that are responsible for improving science and math education as well as instruction in Alabama. Including AMSTEC, AMSTI, STEM, and ASIM referenced in the report already acting. (pg. 5-9 of science) Additional agencies and initiatives would be wasteful and increase state bureaucracy in science education. We also already have existing Colleges of Education which teach courses on science education and require teacher preparation that cover these areas of education. These college education departments should not be supplanted by new state agencies. Math educators should not be focused on “advocacy” or “empowerment”. (pg. 2 of math) Community development and workforce development should not be the primary focus or main goal of math educators in Alabama. However, an entire subcommittee was set up to focus on these areas. (pg. 2 of math) The main goal of math educators in Alabama should be to provide excellent and high quality math instruction to public school students. The sub-committee “Teacher Education Programs in Higher Education” was almost primarily composed of individuals from higher education instead of current k-12 instructors in Alabama’s public schools. Math education summary shows a derogatory perspective on Alabamians and especially parents. “The committee urges the public to help make these recommendations a reality by realizing mathematics cannot be a dinner joke about not mattering in our lives.” (pg. 41 of math) This derogatory approach to parents and students is harmful to engaging parents in education reform. It should not be supported. It is not funny that in its forty-six-page report and 55 recommendations not one includes addressing failed Common Core math standards. Alabama’s parents care deeply for their child’s education especially in math and that is why they support reforms to current standards. In addition, the strategic planning committees did not include parents or students in their process. While their report describes their extensive work they only met three times. (pg. 2 of math) Eagle Forum of Alabama recommends reworking the Alabama Ascending Plan and removing input from the strategic planning committee as they worked outside of the ESSA implementation process. In addition, their suggestions were not shared or discussed by the ESSA implementation committee members. Some of the committees suggestions, if implemented, would violate federal law. “This will be accomplished through a nationally aligned rigorous curriculum….”. (pg. 5 of reading) Since a national curriculum has been prohibited by Congress, the promotion of such a system conflicts with ESSA. Eagle Forum of Alabama strongly advises removing any references or recommendations from these three committees or suggestions from any of the planning committees in any attached plans or included documents with The Plan. While the department will need to share the applicable laws on its state website, promoting ESSA or legislation that gives the Secretary at the Federal level authority over Alabama’s education system is not the proper role of ALSDE. The ALSDE was not tasked to defend or promote the federal education legislation through parental engagement tours or its ESSA meetings. Instead the requirement of public input meant reaching out for meaningful feedback on ESSA. Eagle Forum of Alabama supports Superintendent Sentance, Governor Ivey and the State Board of Education in taking the best advantage of ESSA that is possible under the law. Unless the items or areas allowing for flexibility under ESSA are utilized, no greater flexibility will be achieved for Alabama in education. We recommend that the State Board of Education vote down The Plan in its current form until these recommendations have been made since The Plan will be a legally binding document with the federal government. There is no guarantee the USDOE will approve amendments or changes at a later time for Alabama.